In a Surprise Move, Japan joined the negative interest rate club on January 29. The Bank of Japan expected the move would force consumers to spend some of their money. Amusingly, the only sales surge is for safes, a place where the interest rate is always zero, no matter what the central bank fools do. The Wall Street Journal reports Japanese Seeking a Place to Stash Cash Start Snapping Up Safes. Look no further than Japan’s hardware stores for a worrying new sign that consumers are hoarding cash—the opposite of what the Bank of Japan had hoped when it recently introduced negative interest rates. Shimachu Co. , which operates a chain of stores selling hardware and home products, said Monday that sales of safes in the week that ended Sunday were 2½ times higher than in the same period a year earlier. One safe that costs about $700 is now out of stock and won’t be available for a month, the chain said. The core banking unit of Sumitomo Mitsui Financial Group Inc. reduced its ordinary-deposit rate to 0.001% from 0.02%. That means the equivalent of a $1,000 deposit at the bank would bring just a penny a year in interest, which would get wiped out by the fee for a single ATM withdrawal on weekends. That costs about a dollar. “I am a bit worried about what will happen next,” said Kazuo Matsumoto, a customer at one of the Shimachu stores in Tokyo. While he didn’t buy a safe, the 64-year-old said he might turn some of his cash into gold and keep it inside a safe-deposit box he rents. 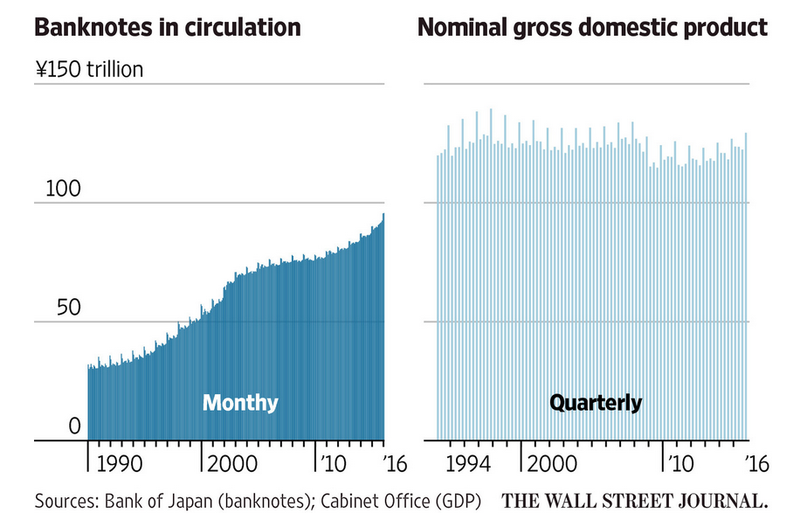 Cash in circulation has risen with each lowering of interest rates as Japanese savers turned to hoarding cash. Rather than admit the foolishness of their policy central bankers turned to negative rates. The response by consumers was to turn to safes, not only to avoid negative rates, but also to avoid ATM charges. As for turning cash into physical gold, Kazuo Matsumoto has precisely the right idea.